So you’ve heard it “My first product launch brought in x amount of dollars and it was all because of my subscriber list” or “I make x amount of dollars per month marketing affiliate products to my email list” and you suddenly have an aha moment. You are going to build an email list so you too can make money from your blog. Off you go to sign up for one of the recommended email service provider Convertkit or yf you are strapped for cash, mailerlite. Then you plaster the traditional “sign up to my newsletter” opt in form in your sidebar, header, all over your website, tweak the colors, fonts and text, publish, and tweak them yet again. 3 new optins in less than 24 hours! Mom, Aunt Macy, and mom’s corrected email. But you don’t give up, you follow expert advice and create a ‘free offer’ to incentivize the signup because you can’t afford not to get more subscribers if you want to build a profitable blog that lets you stay home with your kids. And it works! Instead of just mom and aunt Macy, you get maybe 4, 5 even 10 subscribers who think your freebie is so fantastic they’ll just store it for later when they can dedicate their undivided attention to devouring all 100 pages of it! And now, you are only 1992 new subscribers away from the numbers you’ve seen thrown around in the facebook groups (join mine). Set your list growth on fire! 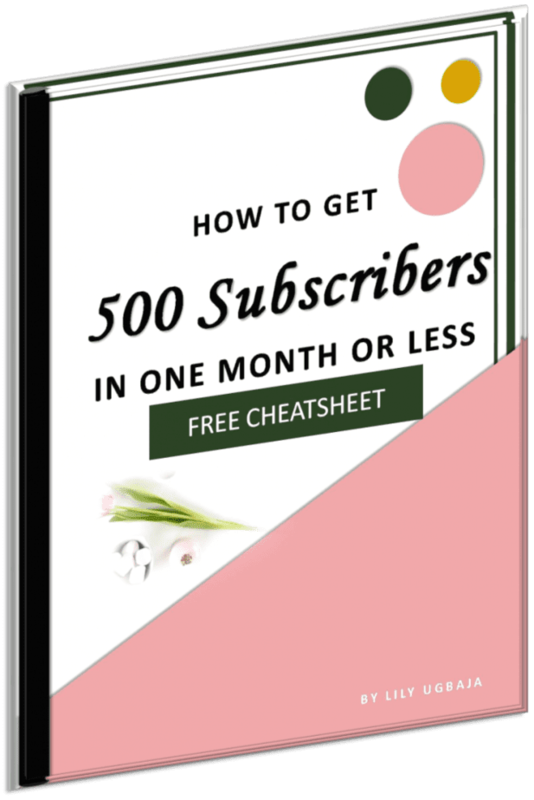 Grab this cheatsheet for a foolproof way to gain 500 subscribers in one month even if you have low blog traffic + gain access to other resources in my exclusive library. You DON’T have nothing valuable to offer, you haven’t chosen the wrong niche, you see the traffic, it’s just not converting. Side note: If you have doubts about your niche, check this list of profitable blogging niches just to make sure. 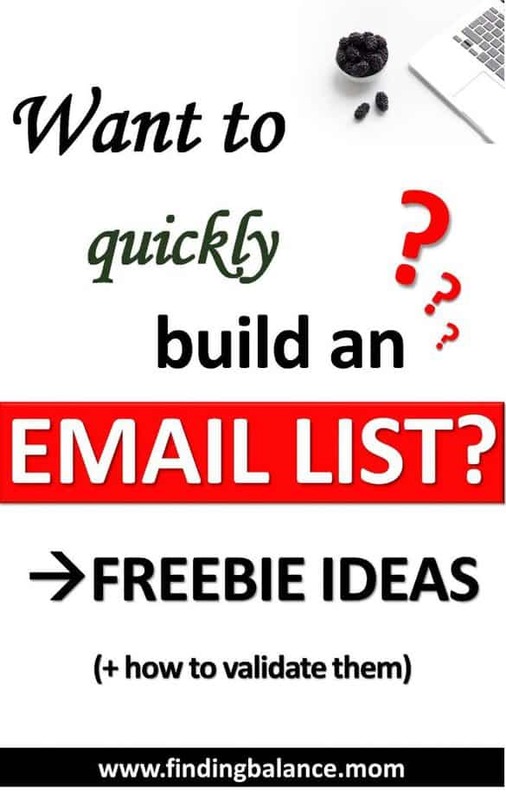 Yes, to build a blog that really makes money you most likely need an email list. Yes, to grow one now more than ever when an inbox is even more sacred thanks to email marketing, you need to offer a lead magnet good enough to make someone invite you to invade their sacred space. To ‘convert’ your traffic and get more subscribers, you have to not just offer a freebie, you have to offer the right freebie to the right person. That is why the process of creating a great opt-in freebie or lead magnet starts with honing in on your avatar. When you know who you are trying to convert, you can then write epic blog posts that promote your irrestible opt in, sit back and watch your list explode (well for the most part). A great opt in offers something fairly different, i.e not something every other blog offers. Has a headline that depicts exactly what the offer is and literally screams “grab me!”, we discuss headline ideas further down. And above all, optins have to first align with your content marketing strategy, which means it has to lead to a product or service you intend to sell in the end, that’s why it’s called a lead magnet. What you want to build is something that makes your new subscriber think “hey, I could have totally paid for that”. 1. What Is Your Target Audience Struggling With? Anything you create that doesn’t help them out with a problem is already a fail. 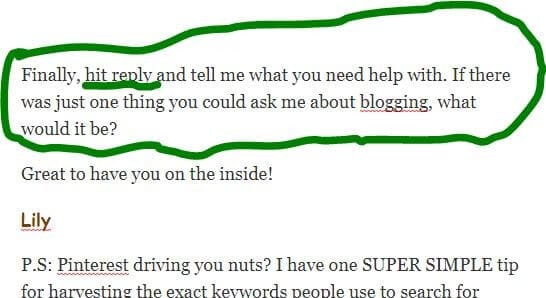 In emails, yes those cutesy “what do you need help with?” concluding lines emails you’ve seen are actually surveys meant to help the blogger discover what her audience wants. In your facebook group if you have one. Same principle with asking in email and people will be stoked you are actually trying to help them! 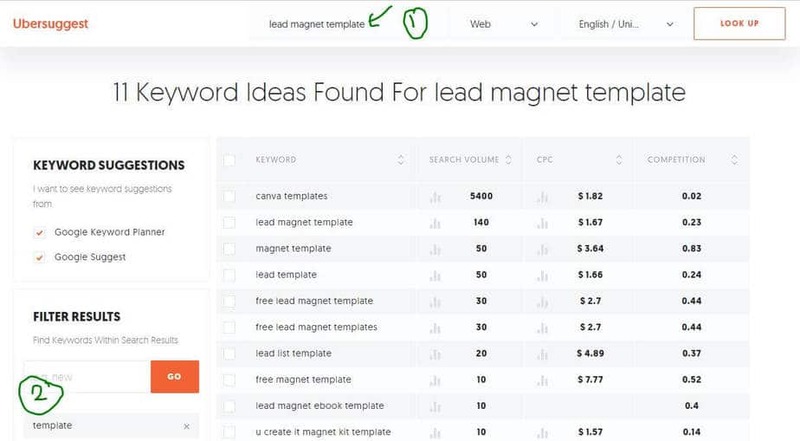 This is how I know for sure that people are searching for the lead magnet template I’ve created to accompany this post. 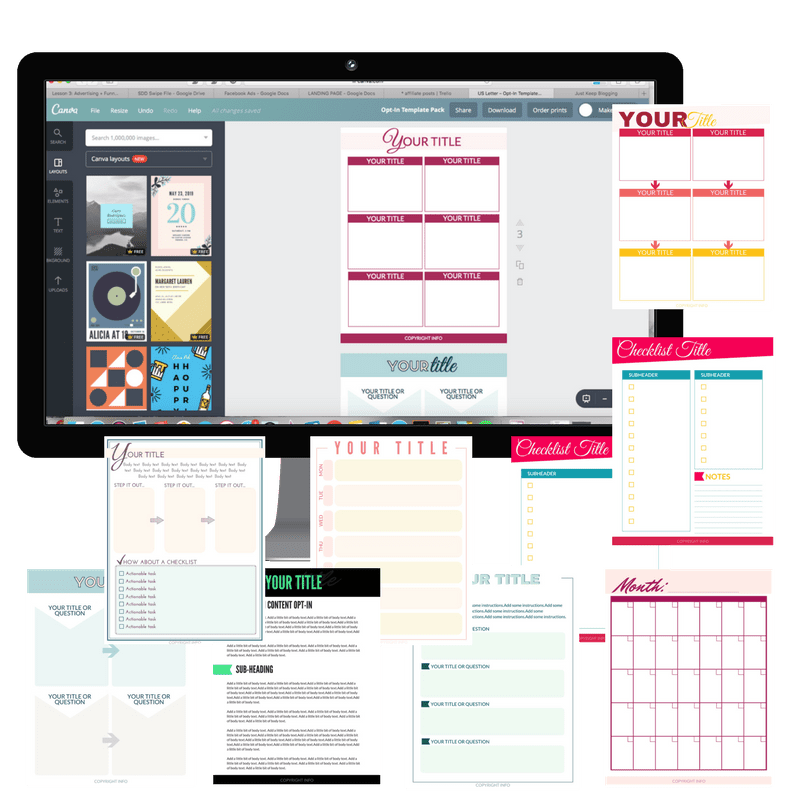 Not only that, I know that since people are searching for canva templates, the program I should use to design my lead magnet template optin freebie is Canva! I also know because of the cost per click – CPC, that people are willing to pay for templates, so maybe a product down the line? Bam! There’s huge search volume with pretty low competition for “potty training in 3 days” and other variations of it. But there’s something else too. When people set expectations, they usually are willing to pay for their expectations to be met. So this is a free lead magnet idea with money making potential. You see what a powerful tool keyword research is not just for creating blog posts people love but for optins and paid products too. Now that you know what your avatar is searching for, how should you best package your opt in freebie? Here are some irresitible opt in freebie ideas to get you started. These are probably my favorite optins. They promise a very short, simple and clear-cut solution to a problem. People know they can grab it now and come out with clarity in 10 minutes. Perceived to be of higher value than worksheets or cheatsheets, workbooks engage the subscriber, reinforces what he’s learnt and imprints your brand in his memory because of the value he gets from this self exercise. 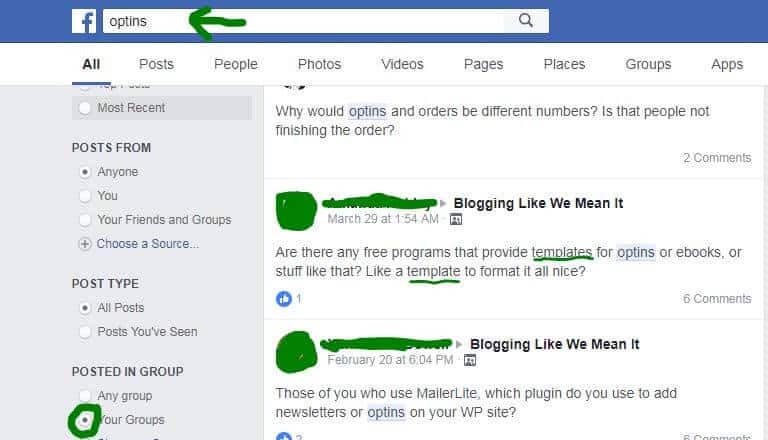 You could offer a basic solution where your subscriber simply has to change out some words or elements. This is the pinnacle of making things easy for your subscriber and don’t think it only works for business niches, it works in every niche. Like I’ve added a Lead Magnet template to this post about creating lead magnets, and pinterest templates to a post about pinterest! The main attractive feature of this optin is the live interaction it promises. A subscriber can ask questions and get feedback immediately. Another thing that makes it a really great option is the easy to consume visual content. Another interactive way to get subscribers, quizzes feed on curiosity and will always trump worksheets or workbooks when done right. Quizzes are so irresistible that some sites like buzzfeed.com run entirely or for the most part on quizzes. Roadmaps offer a complete picture and a map to getting to a desired result. Most times it’s not that people don’t know what to do, it’s that they don’t know what to do when. A roadmap does so well because it solves that problem. Courses are perceived to be more valuable than anything else on this list, except maybe a webinar or free consultation, so they work. One of my absolute favorite lead magnet ideas, email courses especially (call me old-school) provide indepth premium content dripped daily to build anticipation, eliminate overwhelm and trigger action. If someone was already considering your product, a discount or even free shipping offer means a sure signup. I see you parenting, food and organization bloggers saying “Amen”. J These gems convert so well it’s almost impossible to go wrong with them. You should exercise caution however to make sure that your offer align with your end goal. This is a viral way to grow your list. You could give away a valuable product, tools and resources, anything at all. Just make sure that what you are giving is something that attracts ONLY your target market. A free consultation service; skype call, audit, anything that promises a personalized experience for free will always attract sign ups. The only question is, do you have the time and resources to manage it? A good way to limit time spent yet make it valuable to everyone is to run your free consultation offer as a draw or giveaway then anonymously (or otherwise) publish your results. While the incentive examples above are a good place to start, there are some essential qualities optins that will convert, get used and produce positive feedback have. If you are trying to offer your audience something they don’t know the need, your optin has failed already. You need to offer them what they want, what they are actively searching for then when you successfully have them on your email list, you can then wow them by showing them those things they need that they don’t know they need. Like I mentioned previously, yet another “How to do something that every blogger ever has taught how to do” simply won’t sail. You may have a unique perspective on it and offer a ton of value that they’ll actually thank you for once the see it but the challenge will be getting them to sign up for it afterall. People have seen 3, 4, 5 of that same optin and they all said similar things, why should your own be any different? The truth is a freebie is a freebie. People do not attach much value to it even if it’s the best content on the planet. So, people do not want to waste or even spend their time on your freebie. If your lead magnet cannot be consumed in one sitting, it’s probably too much information. Break it down until it becomes something they can use NOW. The result your opt-in freebie promises should be one that they can see almost immediately. It should say exactly HOW to do something so that they can implement it, see results and become fans immediately. Your goal with creating a free offer is to attract a target audience that will buy from you eventually. It shouldn’t attract just anybody. A giveaway of $100 Amazon gift card for example will attract just about anybody to your parenting blog, but a $100 gift card towards a baby registry will attract only pregnant moms. As well as attract the right audience, your opt-in should act as part of a funnel to your product. In other words, if you don’t have a product or don’t intend to sell one that is related to the opt-in you’ve set up, it counts for nothing. “Content is King, design is Queen” this is so true when it comes to optins. Maybe they are both kings even (we can have two kings right?). If your opt-in is poorly structured and designed, your new subscriber will have to fight to keep her attention with you and in today’s world where there are a million and one things constantly competing for attention, it’s easy to say you won’t win. Great design alone won’t sell your opt-in freebie. Yes, even though it’s a free offer sell it you still must. In fact, it’s great practice for selling your actual paid products. So you need to sell with design and words, and sometimes words alone. The best headlines are clear not clever, say exactly what they get out of it and when. I’ve started testing a strategy where you include high value words like “Premium” and will publish my results via email next week. You don’t couple a lead magnet that talks about several different topics and slap them up in an opt in form. There is just no way you are going to generate good leads that way. The best optins that get people to actually act are those that focus on a single topic. In addition to the above, you may decide to use landing pages to provide a distraction free arena for leads. Bluchic has a robust one time purchase or you could use the 4 free landing page templates provided by either Convertkit or Mailerlite, my recommended mail service providers. Questions, contributions, let them fly, I reply to every comment and every share is appreciated. Headlines & clear results are two of the most important pieces of a great giveaway! You bet Maggie! Thanks for sharing.